The coolest of cool girls, Solange Knowles, attended NYFW's Creatures of Comfort show wearing an outfit that expertly displayed how to wear the ballet trend in real life. She took a simple tank, cool pair of jeans, and block-heel sandals, and topped the outfit off with a trench made of the most ballerina-esque of fabrics—tulle. The sheer fabric is just as of-the-moment as velvet, but much more weather-friendly for the still-warm days of late summer. Zara and Net-a-Porter have stocked a plethora of tulle pieces recently, and Solange's endorsement of the trend is further proof that it's quickly gaining momentum. Another tulle bonus is that it's so lightweight and sheer that it'll enhance your outfit without covering it up. But perhaps the best characteristic of the fabric is that it has the power to instantly make any outfit look ethereal and pretty. Keep scrolling to see Solange's casual-cool way of styling tulle, and shop a few of our favorite tulle pieces. 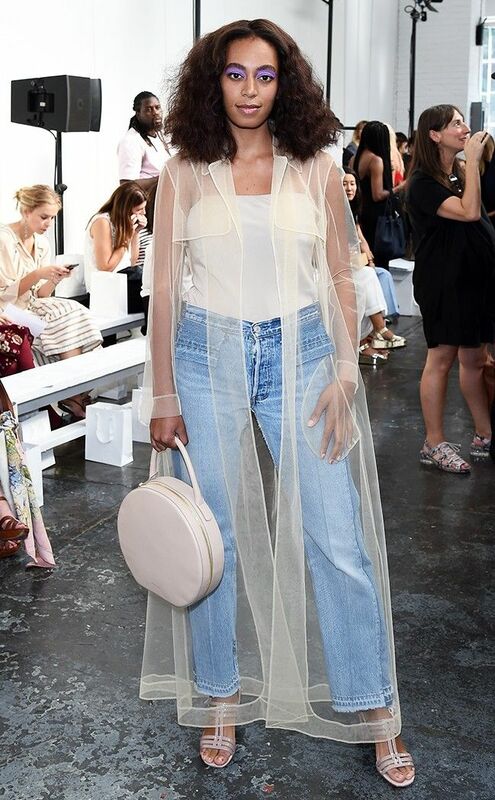 On Solange Knowles: Noon by Noor jacket; Maryam Nassir Zadeh jeans and Rosa Patent Leather Sandals ($502); Mansur Gavriel Circle Bag in Rosa ($1095). Layer this over just about anything for instant cool factor. If you're seeking edgy-pretty tulle pieces, look no further than Simone Rocha's latest collection. Wear this delicate off-the-shoulder top with jeans for a chic date-night look. Capitalize on the ballerina theme by pairing with a bodysuit and ballet flats. Check out our favorite ballet flats to pair with tulle.